daveha11 October 1, 2018 August 6, 2018 They promised us ... the Guardian, 2018. To see the published Guardian article, see here. You can thank HG Wells for the idea in your head of a raygun. Weaponised lasers, microwave beams, particle beams and so on … Wells’ Martian death rays in 1897’s War of the Worlds sparked the concept, but one Albert Einstein offered a proof of concept in 1917, and then Charles Townes finally made one (OK, a laser) in 1951. 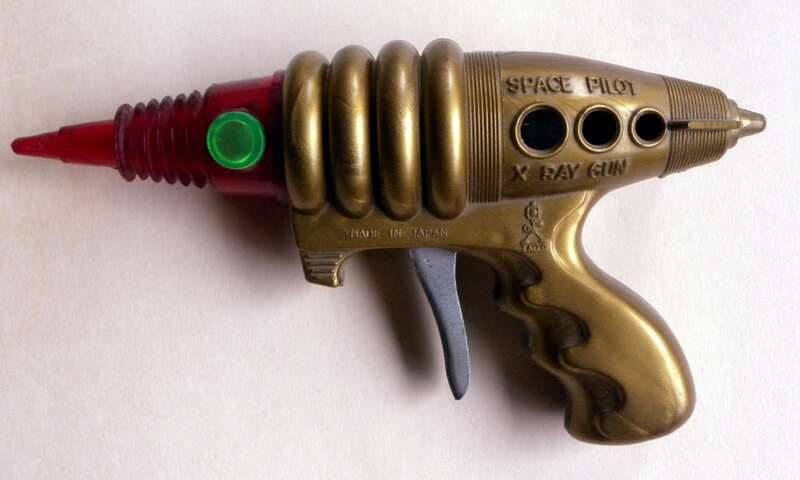 Star Trek injected further vim to the fantasy of handheld zappers with its phasers, followed by the blasters of Star Wars – enough appetite to stimulate real military research – remember Ronald “Raygun” and his Star Wars program? Military research into so-called directed energy weapons (DEW), continues to this day. So why, in the 21st century, are we still hurling bits of hot metal about? Where’s my raygun? Compared with conventional weapons, a laser could be deadly accurate, silent, light speed, cheap to use, and you’d never run out of ammo. But so far, the chemical reactions in guns and artillery are just heaps more efficient. To pack the same kinetic punch as a bullet, you need a lot of energy to deliver the mass. For a laser beam, say, made of (massless) photons, that’s around 2000 joules of sharply focused energy – at least 30,000 watts per zap. At present, that entails a colossal power pack – a battery the size of a bedstead is fine on a large vessel such as a boat or a plane (and don’t worry, they’re working on them), but problematic on a handgun. Compounding this is the fact that lasers are notoriously inefficient. Air is just an awful medium for a laser beam to travel through, made worse by rain, fog or smoke – the sort of conditions you’d find – ahem – on a battlefield. To burn a hole through that lot, your beam needs to be as powerful as possible, and that means it’s likely to be invisible – visible light, by definition, scatters energy: not efficient. So wave bye-bye to those rapidfire rods of glowing death you see in Star Wars (besides, photons can’t be persuaded to do that). And with all that power comes the problem of overheating – after all, we’re talking about radiation – so your gun might melt before you could hit anything. However, a new technology called adaptive optics, developed for telescopes to compensate for atmospheric noise, which concentrate the beams, aims to overcome some of thse challenges. Naturally, the world’s military is still having a bloody good go at developing these weapons, though as far as we know, only the US has one in use – a lower-energy laser system that can zap landmines, called ZEUS. Nearly all the programs seem to become defunct, the funding withdrawn, only for a successor project to pop up like a space-age whac-a-mole. And these are just the ones they’ve told us about. Star Wars, or the Strategic Defense Initiative, envisioned satellite-borne X-ray lasers zapping ICBMs out of the sky. A sort of “son of Star Wars” – though myriad legacy projects might’ve deserved that moniker – was the US army’s tactical high energy laser (Thel), which could shoot down incoming missiles travelling at mach 1 from over six miles. Discontinued in 2005, Thel begat the US Air Force’s Airborne Laser, nicknamed YAL-1, which, strapped aboard a jumbo jet crusing at 40,000 ft, could destroy a ground target 60 miles away. Likewise, the US Navy’s version, the Free Electron Laser, looked promising, but funding ceased when they discovered a new toy – Northrup Grummn’s Firsestrike array, introduced in 2008, which is powerful and accurate enough to disable airborne cruise missiles, rockets and even flying shells. At a cost of 59 cents a shot, it’s easy to see why the military is interested in developing Firestrike. Plasma weapons might also trump lasers. These fire a beam of plasma – basically what lightning and the sun is made of. As far back as 1993, The US was working on the mysterious Marauder project, designed to hurl doughnut-shaped plasma projectiles at near the speed of light. It proved remarkably successful, but suddenly nothing was heard from the lab after 1995. The latest effort, the BBC reports, is a laser-guided lightning weapon developed by the US Army (again) called the Laser-Induced Plasma Channel, which creates a laser beam so intense it creates plasma along an intense, directable beam – if that works it will be scary. The US Air Force has also developed a microwave weapon –a riot-contol zapper called the Active Denial System, which causes debilitating pain by heating the water in your skin. This nasty little gizmo is still being tested for long-term side effects, but naturally, police forces both in the US and China are holding out for a handheld version. These microwaves – like the ones given off by your mobile phone signal – might also be used to fry missile and plane electronics remotely. Now you know why you’re asked to switch off your phone on take-off. Likewise, EMP strikes could be potentially catastrophic – enough to zap an entire city’s electrical infrastructure. Experts at the University of Michigan are looking at those to direct at airborne threats. They have even mooted the idea of particle beam weapons, which emit a high-energy beam of subatomic particles that can turn a target’s atomic structure into scrambled eggs. The downside of this idea is that, while they would work fine in a vacuum, in an atmosphere, those particles scatter and bounce around, bathing the assailant in a lethal dose of radiation. Hoist by your own atomic petard. Adaptive optics may soon make dogfights, or even missiles, a thing of the past, but are we any closer to our handheld raygun? Perhaps the closest we have is the US Army’s PHASR, designed simply to blind and disorient targets. And engineer Pete Bitar, whose company develops non-lethal DEW tech to fry the electronics of potential truck bombs, is just one expert among many who say his tech could easily be adapted for handheld devices – even smartphones – within years. In the meantime, you can at least enjoy the lunacy of YouTube and Styropyro’s homebuilt “laser bazooka”, which is 30m times more intense than staring at the sun and is able to burn through metal casing, which he does with evident glee (how is that legal? ); or his morally questionable laser cannon, which can shatter glass. Or, witness the work of one Rob Flickenger, with his lightning-throwing Tesla gun. But why bother with rayguns? Hi-tech doesn’t always mean better: why spend billions on a microwave crowd disperser when a simple watercannon already proves gruesomely effective? In combat, laser beams make you a sitting duck for return fire, given you’re shining a light at the target. You can lob shells over pretty much anything; missiles you can even direct in flight. So you may have to wait for your raygun – but anyway, haven’t we got more pressing things to worry about? Next Supersonic flight: will it ever rise out of the ashes of Concorde?